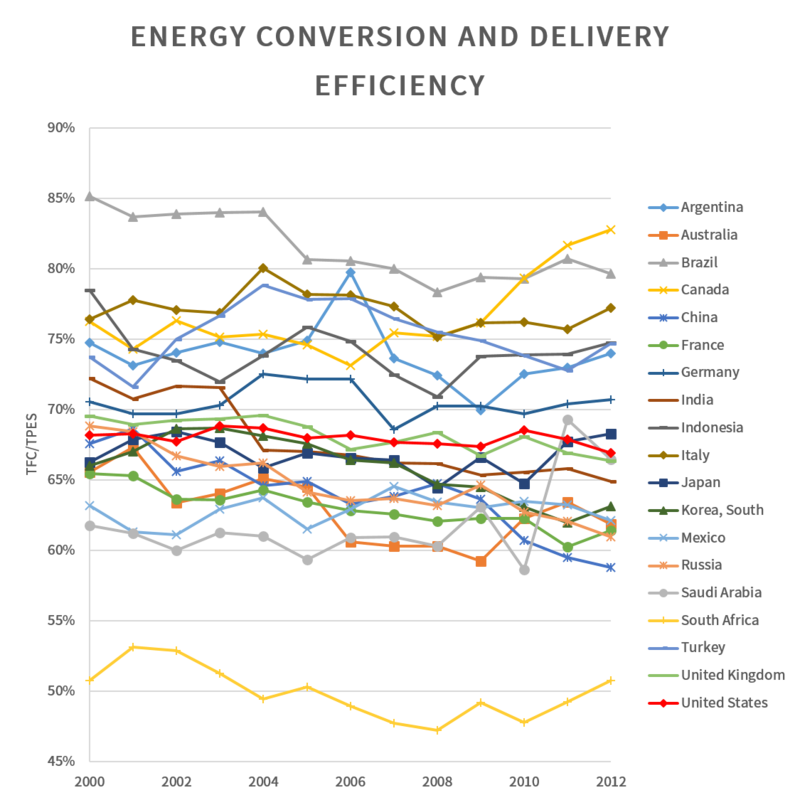 How do we measure the efficiency of energy conversion and delivery at a country level? I am here using the 'final to primary energy ratios,' which is coined by the UN's Sustainable Energy for All initiative. As the name implies, it is simply calculated by dividing a country's 'total primary energy supply' (TPES) by her 'total final energy consumption' (TFEC or TFC). I compared the ratios between G20 countries (except the European Union). 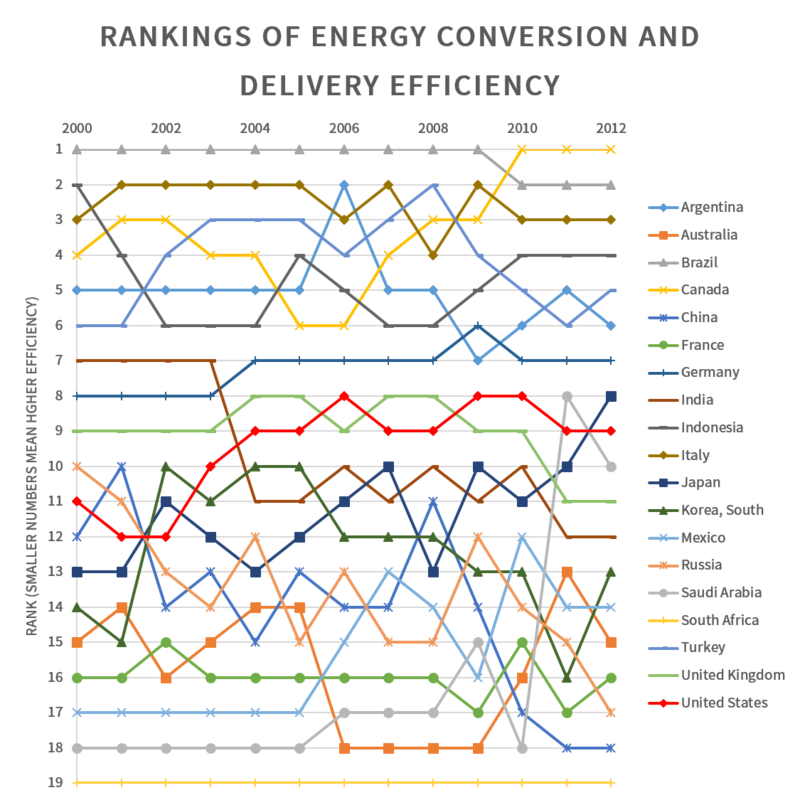 The following figure shows a gradual decline of the energy conversion and delivery efficiency. The latest IEA/World Bank report for the Sustainable Energy for All initiative ("Global Tracking Framework Report")) explains that main causes would be "the growth in coal use for electricity generation, and coal, oil, and gas consumption for heat provision relative to other primary resources" (p. 123). In my opinion, electric heating (instead of heating by direct combustion of gas/coal/oil/biomass) is another cause of the declining shares of final energy consumption in primary energy supply due to increased number of energy conversion stages. As for coal power's effects on lowering energy conversion efficiency, the reason is clear. Recently, a dutch energy consultancy Ecofys reviewed the performance of fossil power plants in Australia, China, France, Germany, India, Japan, Nordic countries (Denmark, Finland, Sweden and Norway aggregated), South Korea, United Kingdom and Ireland (aggregated), and the United States. The study (2014) finds, in 2011, the weighted average energy efficiency of coal-fired power plants was 35%, that of gas-fired power plants was 48%, and that of oil power plants was nearly 40%. Increasing consumption of the low-efficiency coal power explains why China's efficiency is getting worse every year. According to the World Bank's database for the Sustainable Energy for All initiative, China's coal power production grew at an annual growth rate of 11.8% from 2000–2010, whereas the country's primary energy supply rose by 8% annually during the same period. South Africa's heavy dependence on coal power (94% of electricity production in 2010) might be keeping the country at a remote bottom among G20 countries in terms of energy transformation efficiency. I cannot explain Saudi Arabia's sudden efficiency improvement in 2011 and 2012. Because Canada's efficiency has also improved recently, I suspect management strategies of the surplus crude oil by the two oil exporting countries have any effect on the final to primary energy ratios. However, there's a problem in this accounting method of aggregating different energy resources. Because the overarching unit of the IEA's energy balance, tonnes of oil equivalent (TOE), cannot appropriately deal with renewable and nuclear energy sources. While fossil fuels (coal, oil, natural gas) can relatively easily compared among each other by their thermal energy content, it is very difficult to compare renewable and nuclear energy sources. Therefore, most renewable energy sources and the energy in nuclear fuel rods (mostly, processed uranium) are measured by the amount of electricity generated by each source. The prime example is Brazil. Because the country's electricity mostly comes from hydro power (87% of electricity production in 2000; 78% in 2010), the final to primary energy ratio has been number one until outranked by Canada, another heavyweight producer of hydro power (59% of electricity production in 2012). I think this mixed dealing with fuel and non-fossil energy sources are distorting the overall energy transformation efficiency statistics. Or am I unaware of a simple solution of my frustration over this problem? International Energy Agency. (2003–2014). Energy Balances of OECD Countries. Paris, France: IEA Publications. International Energy Agency. (2003–2014). Energy Balances of Non-OECD Countries. Paris, France: IEA Publications.